Before you wonder off to your next stop online…hear me out on this one. I know it sounds strange. Taking our boys out for dinner is an adventure. We don’t go out often, but when we do it’s usually with family, so we at least have a 1 on 1 ratio at the table. We divide and conquer, which makes the whole dining experience a little easier…but they are still wiggly. “Get down from there.” Trying to climb over the sides of a booth. “Sit up, this is not our house and you can’t lay on the seat.” When sitting in a large booth. Those of you with littles…you’ve said these things before. I can’t be alone in this. We find ourselves frequenting these places, and especially Two Bros. because it’s super close to where we live. It’s reasonably priced and we can feed our crew for less than most other restaurants! The first time I had their beans was at night and I was totally puzzled by them, as we were eating outside, it was dim and I couldn’t tell by looking at them, what was added. I could tell there was something mixed in, but couldn’t place the flavor the first few bites. It was something sweet, but not too sweet. It was perfectly balanced with the spice from the sauce and the smokiness from the bacon. By the time I’d finished my portion of beans, I’d figured out that there were diced peaches mixed in with the beans and the bacon. Seriously, great (and clever) addition to the beans. The peaches are a tasty addition and a great balancer of the spice and smoke flavors! Here’s my remake of their Pinto Beans with Peaches and Bacon y’all! Add the soaked beans with at least 1 inch of water to a large saucepan or stock pot. Bring to a boil. Stir in the tomato sauce, BBQ sauce, crushed bacon, diced peaches plus 1 cup of the peaches juice. Stir in the brown sugar, pepper. Return to boil, then reduce heat to medium, cover tightly with lid and cook for about 1.5 hours, or until beans are tender. Add salt to taste. 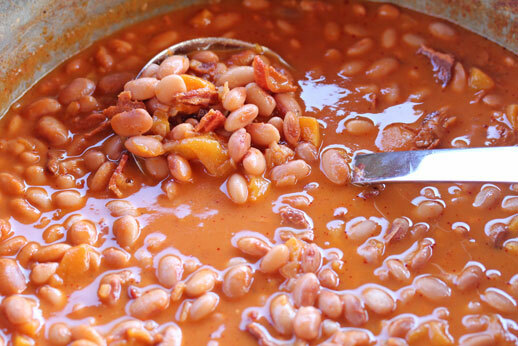 Serve Pinto Beans with Peaches and Bacon as side dish with favorite meat from the grill. They are perfect for a backyard BBQ! Wow, what a great flavor profile. I’m having pulled pork with a peach BBQ sauce next weekend and this recipe would make a great side dish. I used to do something similar for camping trips AGES ago when my kids were small and they LOVED it. I just used canned pork and beans and canned peaches and to make it a meal, would add either diced bologna (used to get chunks from the deli) or bites of hot dogs. 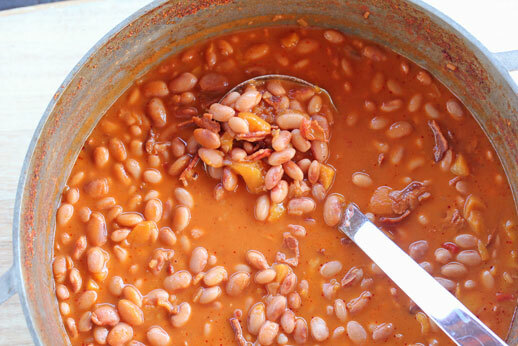 I’ve made pork & beans with diced pineapple for years, but this souns even better!